All will gladly hail these Ultimate Caesar Burgers, made with lean ground beef, crumbled bacon, grated Parmesan and Caesar dressing. Heat grill to medium-high heat. Mix meat, dressing, bacon and cheese. Shape into 8 patties. Place patties on grill; cover with lid. Grill 4 to 6 min. on each side or until done (160ºF). Fill buns with patties; top with lettuce. 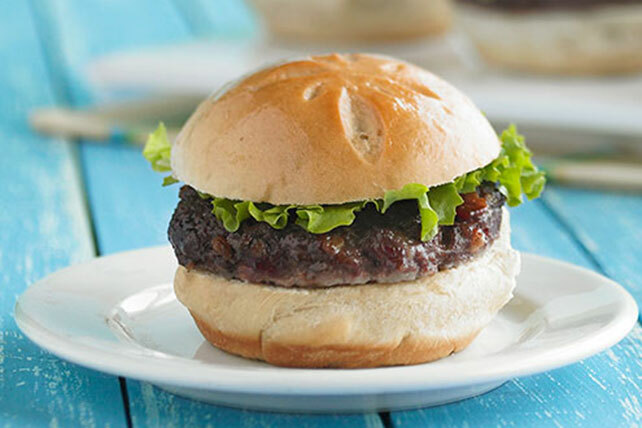 These burgers can be made a day in advance and kept refrigerated until ready to grill.